Schellsburg <?xml:namespace prefix = st1 />Pennsylvania, a small village in western Bedford County, is where John Schell II, his wife, mother, and eight children decided to make their home over two centuries ago. On November 9, 1808, John Schell located and laid out the town of Schellsburg. The town was incorporated as Bedford County's second borough in 1838. Sources suggest that John Schell, like many of his ancestors, had a desire to own a large amount of land on which he could surround himself with family and friends. In May of 1800, John and his family left the Goshenhoppen area of Montgomery County in Pennsylvania for the West, their destination being Kentucky. However, when they reached Pittsburgh, they found that it would not be safe traveling down the Ohio River because of the Indian attacks in the region, so they turned back to the area where Schellsburg is now located. Like many villages that have survived two centuries, the names of the town also changed. In the original patent (1776) for the land which John Schell II bought from James Anderson, it was called “Nine Mile Tavern.” It is most likely that this name originated from the fact that the land area was located about nine miles west of Bedford. 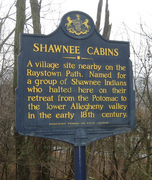 The area was also referred to as Shawnese Cabin Creek, derived from a Shawnee Indian Village that had been located next to a nearby stream, which to this day is named Shawnese Cabin Creek. Throughout the 1800’s Schellsburg continued to flourish, with the usual array of shops, schools, businesses, and professionals needed by the population in town and the surrounding vicinity. In 1908, it was evident from newspaper accounts and photos that the townspeople organized and celebrated the Centennial of the town with a parade and other events. In 2008, once again the townspeople came together to celebrate their Bicentennial year. 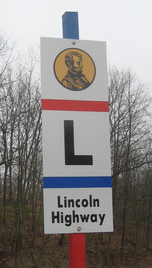 The town of Schellsburg is located on Route 30, the Lincoln Highway, south-central Pennsylvania. The town is listed as having 316 residents in the U.S. census in the year 2000. It was designated a National Historic District in 2001 and placed on the National Register of Historic Places by the U.S. Department of the Interior National Park Service. This was done in recognition of the town's rich architectural heritage of homes, barns, chicken coops and outhouses, 85% of which were constructed in the 19th century of log, locally made bricks or stone.